Not to be confused with Northeastern Pennsylvania. North East is a borough in Erie County, Pennsylvania, United States, 14 miles (23 km) northeast of Erie in the northernmost part of the state; so named because it was in the county's northeastern corner. Fruit growing was an early economic endeavor, and is still to this day, as this is a popular area especially for cherries and grapes. There is an annual Cherry Festival in the summer and an annual Wine Country Harvest Festival in the fall. It contains one junior college, Mercyhurst North East. The population was 4,294 at the 2010 census, down from 4,601 at the 2000 census. 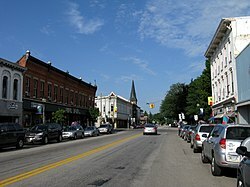 It is part of the Erie Metropolitan Statistical Area. It is the northernmost town in Pennsylvania. The name "North East" is not a misnomer, even though the borough is located in extreme northwestern Pennsylvania, it received it name for its northeastern-most location within Erie County. Before 1650, the area was settled by the Eriez, a relatively peaceful tribe; however, they were destroyed by the Seneca. As part of the Erie Triangle, it was only in 1792 that the locale was legally established as part of Pennsylvania. However, North East did not receive its first settler until 1794, still several years before the county (Erie) and township (North East) were organized. Originally the North East Township was called "Lower Greenfield" being downstream from Greenfield Township. The first road was built in 1797 from present day Freeport at the mouth of Sixteenmile Creek to present day Colt Station now in Greenfield Township. That road was extended in 1798 to where French Creek forks (present day Wattsburg). In 1798 the first school was formed. In 1800 a road from the village of North East to Wattsburg was opened, it paralleled, but ran east of, the first one from Freeport. In 1801 the first church was organized, it was Presbyterian. In 1884 a fire destroyed two-thirds of the town's business district. In 1983 Short's Hotel was listed on the National Register of Historic Places. In 1990 the entire old central business district was added to the register. North East is located in northeastern Erie County at 42°12′48″N 79°50′1″W﻿ / ﻿42.21333°N 79.83361°W﻿ / 42.21333; -79.83361 (42.213385, -79.833711). It is surrounded by North East Township. As of the census of 2000, there were 4,601 people, 1,730 households, and 1,162 families residing in the borough. The population density was 3,515.4 people per square mile (1,356.1/km²). There were 1,795 housing units at an average density of 1,371.5 per square mile (529.0/km²). The racial makeup of the borough was 97.65% White, 0.80% African American, 0.09% Native American, 0.09% Asian, 0.59% from other races, and 0.78% from two or more races. Hispanic or Latino of any race were 1.87% of the population. There were 1,730 households, out of which 35.7% had children under the age of 18 living with them, 48.9% were married couples living together, 14.4% had a female householder with no husband present, and 32.8% were non-families. 29.3% of all households were made up of individuals, and 14.1% had someone living alone who was 65 years of age or older. The average household size was 2.53 and the average family size was 3.12. In the borough the population was spread out, with 27.5% under the age of 18, 11.2% from 18 to 24, 27.0% from 25 to 44, 20.3% from 45 to 64, and 13.9% who were 65 years of age or older. The median age was 34 years. For every 100 females there were 94.5 males. For every 100 females age 18 and over, there were 87.9 males. The median income for a household in the borough was $36,431, and the median income for a family was $43,250. Males had a median income of $33,939 versus $21,921 for females. The per capita income for the borough was $16,132. About 10.0% of families and 13.6% of the population were below the poverty line, including 18.3% of those under age 18 and 11.9% of those age 65 or over. 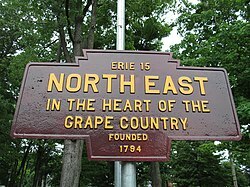 North East's economy is primarily based on grapes. Vineyards carpet the township, and there are at least five large wineries in the area. One of the borough's largest employers is Welch's. ^ Whitman, Benjamin; et al. (1884). History of Erie County, Pennsylvania: Containing a History of the County, Its Townships, Towns, Villages, Schools, Churches, Industries, Etc. 1. Erie, Pennsylvania. p. 724. ^ a b "Geographic Identifiers: 2010 Demographic Profile Data (G001): North East borough, Pennsylvania". American Factfinder. U.S. Census Bureau. Retrieved March 16, 2016. ^ a b "Location & History - North East Borough". ^ "Transportation Plan". Greenfield Township Comprehensive Plan (PDF). Greenfield Township, Erie County. 2002. p. 5. ^ Sands, Patricia A.; Sisson, William (August 1989). "National Register of Historic Places Inventory Nomination Form: North East Historic District" (PDF). Retrieved November 5, 2018. Green, Walter R. (1981) North East, Pennsylvania 1850-1890, Erie, Pennsylvania: Mercyhurst College. Wikimedia Commons has media related to North East, Pennsylvania. This page was last edited on 24 March 2019, at 18:14 (UTC).